At Superbooth we showed an additional feature of the disting mk4 not previously documented or demoed. The disting mk4 has a pair of MIDI ports (in and out), allowing it to both receive MIDI (for additional control over the algorithms) and generate MIDI (to control external MIDI gear from its algorithms and CV inputs). New dedicated MIDI-to-CV and CV-to-MIDI algorithms have been added; existing algorithms have had MIDI output added — notably the Quantizer and MIDI File Playback. 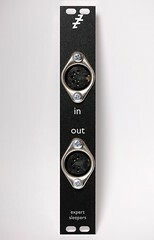 The MIDI ports are accessed by an expansion module, and details are available so people can make their own DIY version, which is a very simple project. It is also planned to release a kit version of the expander — stand by for news on that.